Floating surface aerators add oxygen into the water by first pumping it into the air with a propeller, and then disturbing the water surface as the water comes crashing back down. Due to the high volumes of water being pumped, pond aerators induce water flow and circulation over a large area of water in your pond. For example, the Arbrux 1/2HP aerators move 500 gallons per minute while adding 2.3lbs of oxygen into the water every hour. The advantage of a floating aerator is that it not only provides the functionality to improve your water quality but it also offers a pretty feature to your pond or lake. 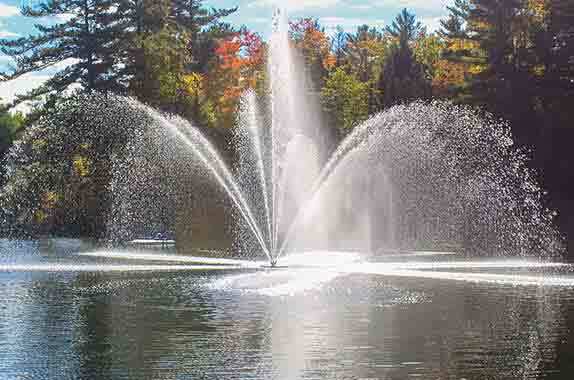 Add an Arbrux pond aerator to your pond, get a quote today!